The last few months have been rough for Toronto roots rockers Bruce Peninsula. Shortly after finishing their sophomore LP in late 2010, their release plans ground to a halt after frontman Neil Haverty was admitted to hospital with leukemia. Luckily for all, Haverty battled hard against the illness, and the group are now getting ready to drop the new LP. The record is called Open Flames, and it will be out on October 4 via Hand Drawn Dracula. The album promises to offer more of the same genre-bending alt-gospel that made 2009's debut A Mountain Is a Mouth such an instant favourite. A press release says that the new disc contains "10 new, sprawling songs, drawn from the skin of a drum and sung from deep down in the gut." Listen to some clips of new music in the two brief teaser videos embedded at the bottom of this page. To promote the release, Bruce Peninsula will be heading out on an extensive tour of Canada's eastern half. The jaunt will have them on the road for much of September and October, so check out the schedule below. To read about Haverty's battle with cancer, check out Exclaim! 's previous interview with the singer. 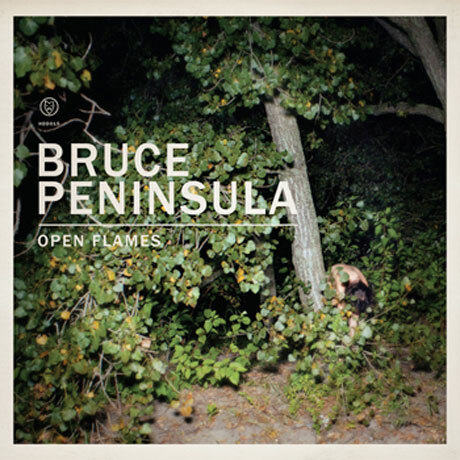 During his recovery, Bruce Peninsula tided fans over with Bruce Trail Fire Sale, a series of free digital B-sides that the band released for free via their website. Bruce Peninsula - In Your Light (Snapshot) from Bruce Peninsula on Vimeo. Bruce Peninsula - Open Flame (Snapshot) from Bruce Peninsula on Vimeo.